Hi Everyone!! The day has finally arrived for the reveal of our new Challenge Team at Our Daily Bread Designs!!! On February 7th, we will begin our first actual challenge as a team. These challenges are weekly and there is lots planned, so be sure to stop back by!! For today, our new team has a lot of fun in the works for you starting with a blog hop and a scavenger hunt!!! You will have the opportunity to meet our team, view our creations and hunt for the scavenger hunt items. Be sure to play along because you'll have a chance to win this "Light of the World" stamp set!!! 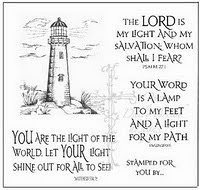 The name of our Blog Hop is called **Shining the Light** - named after the very first stamp set that Kelley came out with, "Light of the World". 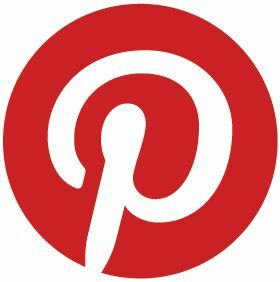 Our team has created cards or projects based on this theme!!! I am sure you will enjoy looking through these creations! So grab a cup of coffee and let the hopping begin!! if you arrived here from (Patter Cross at Triple The Scraps), then you are in the right place! If not, I would reccommend for you to start back at the ODBD blog. Your link on the bottom will be the next person in line TO FOLLOW..... Please remember to leave comments along the way as you are looking for the items in the scavenger hunt. (please note these items can be found on sidebars, headings or backgrounds NOT on actual posts). If you find missing links, simply check back here for the next person in the list and mention in your comment that you were not able to comment on that person's post. This is meant to be FUN ... NOT frustrating! LOL! It's a game with a chance to win a Light Of the World Stamp set... and we understand if someone's blog is "down". Often you can try again later... but if you try and can't leave a comment on someone's blog, simply tell us in your end comment! 1. Complete the hop by leaving comments on each Challenge Team DT Memeber's blog. 2. Return to the ODBD CT blog stating you've visited & left a comments on each. 3. Email chrisolsenodbd@aol.com with the scavanger items found along with blog names where you found them at. 5. Check back on the ODBD blog on January 30th to see who the winner is!!! Here is my card using this great set. NOTE that in a prior post from this week (below) I also used this set-take a look! Techniques: Sponging (I inked all edges). Your next stop will be Chris Olsen, at Twinkles Glow With Stamps. Congrats on being on the Challenge team! Beautiful! Love the colors and all the layers!! Good morning America!!! Your card is gorgeous as always!!!! Love the papers and design and tha spellbinders die!!! Gorgeous! Welcome to ODBd!!! This is absolutely stunning America!! Love the bright colors and your design. Gorgeous coloring!! That spellbinders die to showcase the image is perfect!! Welcome to the ODBD challenge team, I am so excited to be working along side of you! Oh America, you should submit this in the Sat. Spotlight challenge for their "Sunshine" Challenge to use yellow or bold brights. This is one beautiful card, America! Love all the wonderful layers and details! Beautifully done! I'm so excited to be part of this fab ODBD Challenge Team! It will be fun working with you and all the other talented ladies! Wow, fantastic, Vibrant colors here America! I love your use of this die here as well...super! Congrats on being a member of the first ODBD Challenge Team...can't wait to see all of the inspiration you gals will provide! THis is really stunning - such wonderful and vivid colors! Love the layering, too! Great design, awesome coloring! Wonderful! TFS! CONGRATS! WOW! What an AMAZING job you did with this set! ABSOLUTELY GORGEOUS! LOVE your design and attention to detail! Love the card -- especially the colors and the layering. Love the layers on this card! Wonderful job! THis is beautiful, America! Love the bold colors and shapes and the silver cording. Wonderful job and congrats! What awesome layering techniques you are using. Looked at other cards you have made and ODBD will have a blessing working with them. Thanks for sharing. Looking forward to more of these great idea! Oh America, the shape is just stunning. Beautiful use of vibrant color too. I really love your delicate outlining of the lighthouse. Lovely work! Beautiful, rich colors!! Overall "WOW" card!! Wow! Stunning! Love the colors and all the layering! Congratulations on the honor of being on the design team! Your card reminds me of sunset -- it's just beautiful! Love all those layers!! Great job on the challenge! Very eye catching...right down to the lighthouse charm!! STUNNING!!! LOVE what you've done here ... your layout is amazing and the coloring AWESOME!!! Thanks so much for joining us at Saturday Spotlight! Your work has always inspired me! GREAT JOB! WOW!!! This is a beautiful Card!!! The layers and the colors just WOW you. Great Job! Congrats on being a member of the design team! Gorgeous card America! Love the bright rich colors ! Beautiful bright colors and love all the layers and the spellbinders you used too. Wow very striking card. Thanks for sharing. Nice card! I like the bright colors. Beautiful card....love all the details that you put into it! Another stunning, gorgeous card!! Just gorgeous!! This card is wonderful! Your coloring is amazing, the light looks so real. I like the way you placed and presented the verse. Beautiful layering! And the lighthouse charm is so cute! This is soooo beautiful I love this image and these bright colors!! What a gorgeous card, thanks so much for joining us at Saturday Spotlight! Wow look at those colours! Gorgeous card. Oh America your cards always blow me away and this one is no exception!!! 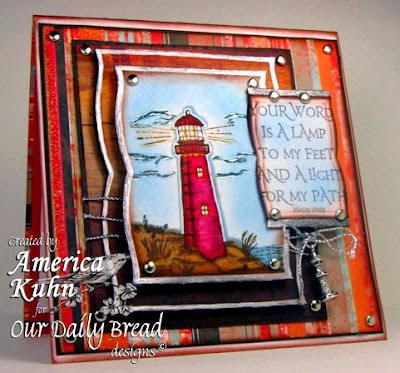 I LOVE the lighthouse in red and love the Spellbinders you used!!! This is awesome! Contgrats on your new DT position!!! You so deserve it,though I hate to lose you from the DT side! LOL! Seriously, I'm so excited for you to be with us in the bread basket!!! Look at all the gorgeous color on this card! Nice layers, too. Thanks for sharing. oooh..It's so vibrant... so colourful.. those papers and layers are fabulous!! Lovely card! Stunning card with all the layers! So beautiful! Wonderful - I love the choice of Nesties and the sponging! Very nice layout! Layers, colors, they're brilliant and so is this card! Great job! Lovely card! And like many, like the bright colors and the layers. Hi america, I really love all your work. the designs and colouring are fantastic. Gorgeous, gorgeous card. Love the layers and the colours. Congrats on making the team. By the way, I have only met one other person named "America." It was my Great-Aunt who was born and lived in Portugal. She never came to the States, it was the desire of her parents to come here one day. Your colors are amazing!! Very inspiring card - thanks for sharing. Dawn F.
The Layers and the Time!!Whoa! great job! Love the layering and beautiful color choices!! WOWZA! Weren't these the colors for a challenge on StampTV? You should enter this there! It's absolutely beautiful! Beautiful card, love the layering. Awesome card! Love the halo effect around the lighthouse and the shape of the c/s on which you placed it and the sentiment. The colors are so bright and stimulating. America: Love the layered look of this card. Bold, bright, and beautiful. Thanks for sharing. WOW, the layers and the colours are amazing!! America thank you for sharing the beautiful card with us I lovee the lighthouse charm sweet touch. Great card, love the bright colors. Oh the colours, the card seems to jump out at you, love it. What a lovely idea for this set. The colors and layers are great. Soo beautiful America!! Love the colors and especially the added touch of the charm--Sweet!! Congrats on being a member of this fabulous team!! Wow this one is a knockout. Love the coloring and shapes. Very pretty! Your colors remind me of a beautiful sunset! The way you layered the card and the bright colors really accentuated the focal point of this card. Beautiful! Very Nice colors !! Beautiful card. I just love what you did with the Lighthouse stamp set. I can certainly see why you are on the design team!! Wow...great combination of colors and pattern in your choice of nesties. Congratulations to you...can't wait to see what's coming up. Wonderful card! Love the colors and layers! Great card. Love the layers you have created. What vivid colors! Love them! Gorgeous! Love, love the colors choices and the layering on this card! I love anything you create, but you definitely rocked my world with this one!! The awesome colors and cool design.....wow!!! It's so great that you are on the Challenge Team....ODBD is lucky to have you!!! God Bless! Beautiful card! Don't you just love your Nesties. I know I do mine. :D Thanks for sharing with us during this fun scavenger hunt. Congratulations on being apart of the ODBD DT!! Your work is just absolutely stunning!! Thank you also for joining us at Saturday Spotlight, gorgeous card!! So vibrant! Love the layering. Thanks for sticking around for the Challenge Team!